Cincinnati: Writer's Digest Books, 1992. 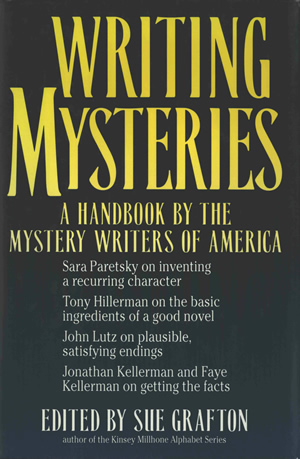 This is the full and detailed view of Writing Mysteries: A Handbook by the Mystery Writers of America, edited by Sue Grafton, and published in 1992 by Writer's Digest Books. Tony Hillerman contributed a chapter, "Building Without Blueprints" to Part II, "The Process," beginning on page 77. This is a hardcover book with dust jacket designed by Carol Buchanan. The front cover features the main title in large print and the subtitle in smaller print below it, in yellow on a dark blue background. The editor's name is along the bottom of the cover, in white. On the back, the title and subtitle are repeated in blue on white, above a descriptive paragraph and a partial list of contents. The bar code and price are printed at the bottom right. The front fold-out contains an excerpt from Sue Grafton's introduction. The back fold-out displays the editor's photo, credited to Carter Blackmar, above the editor biography. The inside front and inside back covers are blank, and the end papers are white. Binding: Full binding, blue paper-covered boards. Title, editor name, and publisher's logo in gold on spine.